Hydrocolloids are water-soluble polymers extensively used in food and nonfood industries. In food products, they are mainly used as a thickening and gelling agents. However, they can also display other functionalities, such as acting as a stabilizing agent, preventing water release during refrigeration, and inhibiting ice crystal formation. They are used in products like desserts, soups, bakery fillings, dairy drinks, ice creams, sauces and gravies, salad dressings, syrups, toppings, jams, jelly, marmalades, and restructured foods. Apart from improving quality attributes, organoleptic acceptability, and shelf-life, hydrocolloids are healthy. The most part is non-digestible polysaccharides which act as dietary fiber and exert beneficial physiological effects. They ensure proper functioning of the colon, reduce cancer incidence, and have the ability to reduce plasma cholesterol, triglycerides, delay glucose absorption, and can contribute to control diabetes. Among the hydrocolloids, pectins are a group of complex polysaccharides made up of mainly galacturonic acid. They are present in the cell walls of all land plants. However, the amount, composition, and properties of the pectin depend on the plant source and conditions used during pectin isolation. For commercial purposes, pectins should contain at least 65 % galacturonic acid. Commercial pectins are categorized into two main types, depending on the way they form gels. The pectins that undergo gelation with sucrose at acidic medium are known as HM pectins, and the ones that undergo gelation by calcium addition are known as LM pectins. Commercial pectins are almost exclusively derived from the citrus peel or apple pomace, by-products from juice manufacturing. The citrus used are orange, lime, grapefruit, and lemon. 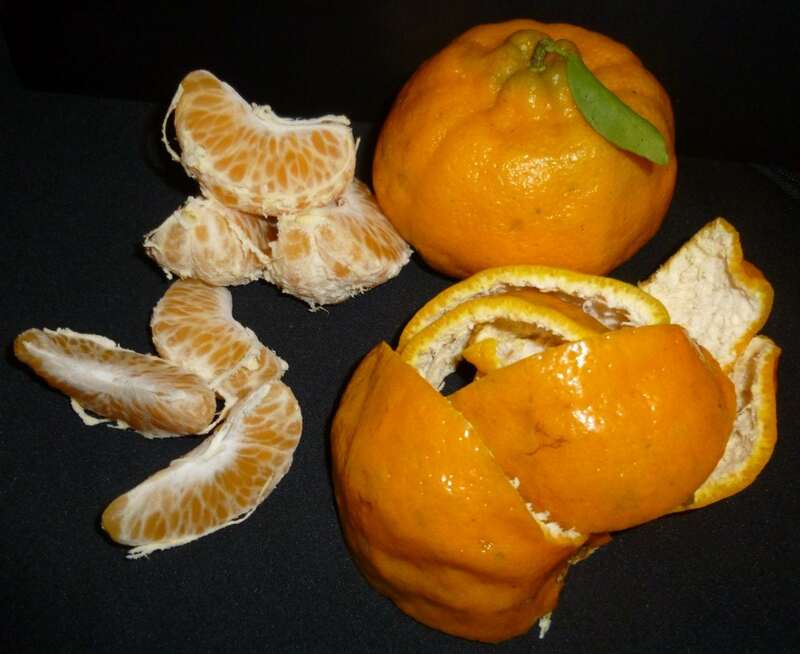 Mandarins also belong to the citrus group, but they are not commercially exploited for pectin extraction. Ponkan (Citrus reticulata Blanco cv. 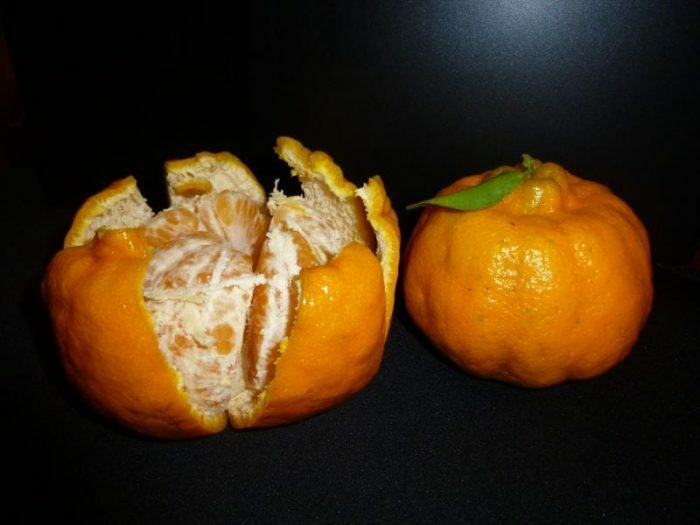 Ponkan) is a variety of mandarin, but it is not used for the industrial production of pectins. A recent study on the polysaccharides of the cell wall of the ponkan peel showed that the pectins can be extracted using different solvents (cold and hot water, ammonium oxalate, diluted acid, and diluted alkali). The purified pectin obtained by extraction with cold water was an LM pectin containing 58% galacturonic acid. When the conditions used for industrial production of pectin (low pHs and high temperatures) were used, the ponkan peel gave rise to a pectin with 85% of GalA, above the minimum content required by the FAO and EU for commercial pectins (65%). The pectin was extracted using a solution of boiling nitric acid under optimized conditions (pH 1.6, 100 min of extraction and liquid:solid ratio of 36 mL/g). The pectin yield, 25.6%, was comparable to other citrus species already used by industry. Like other citrus pectins, ponkan peel pectin was an HM pectin, which can be used in the formulation of acidic foods with high sucrose content. Besides, it can be chemically modified to obtain LM pectins for other applications. These findings show that the ponkan peel can be a promising source of pectins in regions where ponkan is widely cultivated. Brazil is one of the world’s largest producers of this fruit, and a pectin factory already exists in the country. However, the pectin from this factory is obtained only from orange and lime peels. The use of ponkan peel for pectin extraction would help to supply the crescent industrial demand for pectins and to reduce waste and pollution. These studies are described in the article entitled Cell wall polysaccharides from Ponkan mandarin (Citrus reticulata Blanco cv. Ponkan) peel, recently published in the journal Carbohydrate Polymers. This work was conducted by Cristiane Colodel, Lúcia Cristina Vriesmann, and Carmen Lúcia de Oliveira Petkowicz from the Federal University of Paraná, and in the article entitled Extraction of pectin from ponkan (Citrus reticulata Blanco cv. Ponkan) peel: Optimization and structural characterization, recently published in the International Journal of Biological Macromolecules, which was conducted by Cristiane Colodel, Lúcia Cristina Vriesmann, and Carmen Lúcia de Oliveira Petkowicz from the Federal University of Paraná, and Reinaldo Francisco Teófilo from the Federal University of Viçosa. Carmen Lúcia de Oliveira Petkowicz is a researcher affiliated the Universidade Federal do Paraná.